✔ Universal Size Of Waterproof Cases - Dry bag fits all smartphones up to 6.0" diagonal size such as iPhone X 8 8Plus 7 Plus 6 6S Plus 5S 5C 5, Samsung Galaxy S9+ S8 S7 S6 EDGE S5 S4 Note 5 4 3, Google Pixel Nexus, Sony, Motorola, LG, HTC, Blackberry Priv Keyone etc，Enough space for wallet, ID cards, money. ✔ Sensitive Screen Touch & High Transparency Window - This slim waterproof phone cover is designed not to hinder touch screen use even underwater,You can talk, text, swipe, see & hear your cell phone through the pouch at all time. The High quality material makes it easy for friendly screen-touch.Capture either from the front or the back camera ( thanks to specially designed transparent back ), you could perfectly operate your cellphone and take the sharp clear image under the water. 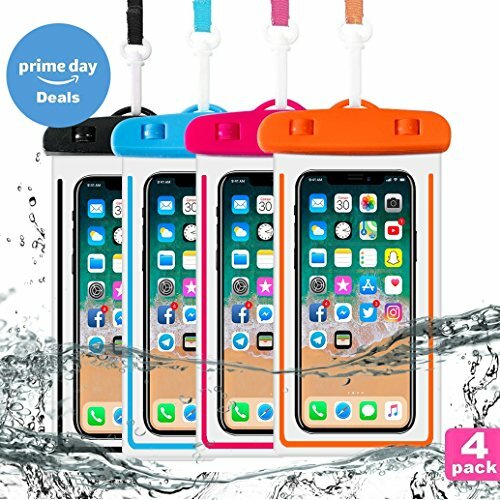 ✔ Super Functional Design - Our waterproof cover keeps your phone 100% resistance from water, dust, dirt & snow whether you are at beach, running, under water, kayaking, snorkeling, shower, swimming, tie the waterproof bag on wrist or put it around your neck enjoying yourself. ✔ Notice - 1.Before using it, please put the case with paper towel and submerged them in kitchen sink to test if it will be water leaking.2.Not support iPhone Home button touch function，Make sure to set your camera button to a physical button when take underwater pics. 3.Waterproof bag inside the fog is a normal phenomenon. ✔ SUPPORT - No questions asked. However, we are quite confident that you will find it as an indispensable mobile accessory with very high quality ( top rated waterproof case of 6inch phone ) and would return back only to buy more for your adventures loving friends and family members. Slim & cute Smart Phone water protector casing for boys, girls, men, women & kids of all ages. Looks good on any color phone ( black, orange,pink,blue,etc). Easy carrying, light weight . If you have any questions about this product by Banter, contact us by completing and submitting the form below. If you are looking for a specif part number, please include it with your message.